One of the arguments that we have made as part of our LMS Market Analysis service is that if you look beyond market share numbers, there has been a tectonic shift in the academic LMS market that started around 2012, moving from being Blackboard-centric to Canvas-centric. Meaning that the current market trends are largely driven by Canvas adoptions and market reactions to Canvas adoptions. This change has elevated the need for viable LMS solutions to have both a cloud-based deployment strategy as well as a more modern, intuitive user experience than what was acceptable just five years ago. Short story - D2L has made fairly substantial bets on cloud deployment and a streamlined user experience, and the product design changes present the best explanation for the market gains. The data looking at new LMS implementations (changing from one system to another) in higher ed across the four global regions we cover in our market analysis shows a remarkable movement away from self hosting, or on-premises hosting, towards a combination of managed hosting by the LMS vendor or cloud hosting designed by the vendor but running on AWS, in particular. From 15% external hosting to 77% in just one decade. Within the external models, there is another major shift away from managed hosting and towards cloud hosting. D2L has long worked on managed hosting options, but in late 2013 the company introduced Continuous Delivery where software releases are pushed to customers incrementally, such that customers would jointly run the latest versions of Brightspace, their LMS. This move is important, as one primary benefit of cloud deployment is to remove the explosion of software configurations and versions that make it expensive and difficult to diagnose and fix bugs and to release new features. Three years later in 2016 D2L announced their move to AWS for cloud deployment. By the end of 2018, a large majority of customers will be on cloud deployment. As of today, more than 50 clients are running Ultra, with dozens more planning to start using the Ultra experience and courses in the second half of the year. 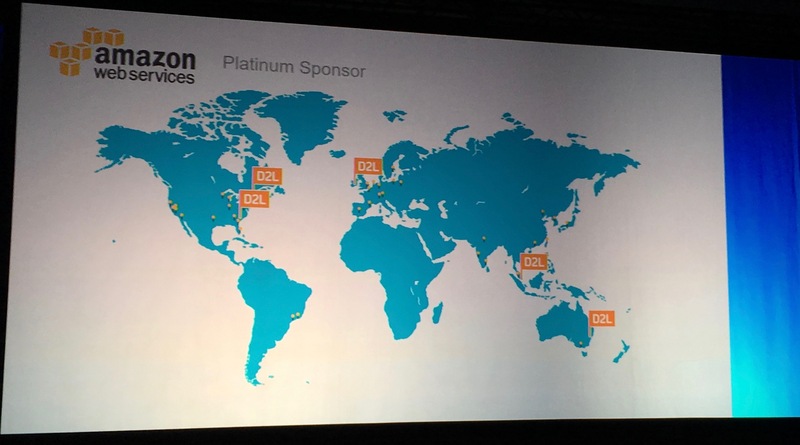 Also, 361 clients around the globe have moved to SaaS deployment for Learn. Our data show more than 2,000 higher ed customers on Learn, but if you add in K-12 and corporate customers, this roughly equates to just over 10% on or moving to Learn SaaS and 2% on Learn Ultra. These are generous numbers, but more on that in a separate post. The point is that D2L is making a much more aggressive and focused bet on the cloud than is Blackboard, for better or worse. Canvas, of course, is designed natively for the cloud, and essentially 100% of their customers are on the AWS cloud. David Koehn also pointed out that the real driver for the AWS cloud move by D2L is to enable a redesign of the user experience and to provide improved scalability and reliability. In other words, the cloud deployment is a means to the Daylight end. Daylight is the name for D2L's redesign of the user experience and its streamlined user interface. When it was first announced just over a year ago, I was somewhat skeptical as the initial changes were evident in different fonts and cleaner look-and-feel, but not significant improvements in the workflow for faculty and students. As time goes on and I see more advanced demos, my view is changing. The Daylight Experience does have some real improvements not just in look-and-feel but in fewer and more intuitive clicks to get the same job done. 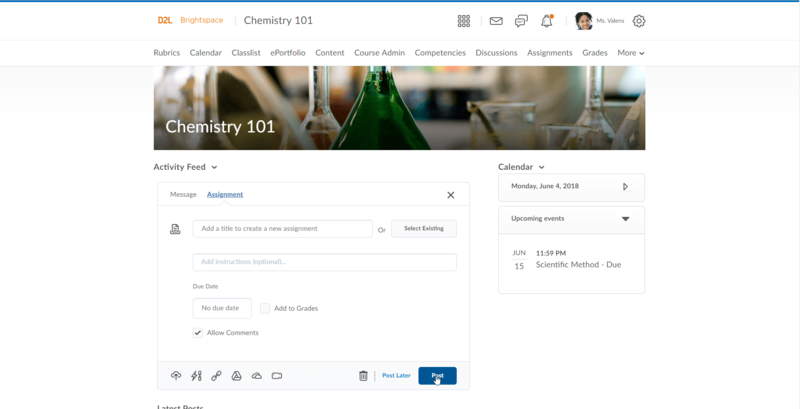 A major focus on the release this summer (in time for D2L Fusion users conference) is more fully encouraging usage of the activity stream for higher ed clients (this feature was initially targeted at K-12 market but has been adapted for colleges and universities). D2L has long played the Mutually Assured Destruction game of features, targeted at cumbersome procurement processes. D2L (along with Blackboard and Moodle) has a deep set of features which contrasts with Canvas and its streamlined set of features that rely on third-party integrations to solve some of the more specialized use cases. For D2L, it is important to maintain these features as a competitive differentiator with Canvas, and the design approach guiding them is Progressive Disclosure. This design technique relies on progressing from simple to complex, showing the user the information and options they need when they need it or request it and not before. 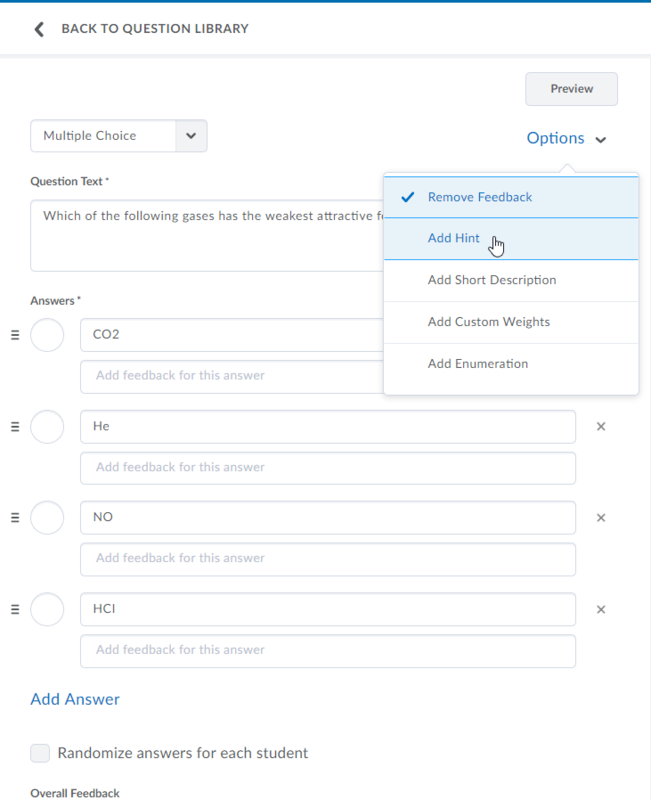 Consider adding a multiple choice quiz, where the desire is to make this process very simple, but to then have a page or area that exposes more and more options as requested by user or in context of the quiz setup. As D2L further implements this design approach within the Daylight Experience, we are seeing a more modern and intuitive user experience for Brightspace customers, yet one that is showing real promise to also tap into deeper feature sets. And these changes are being used in production. Again by way of contrast, Blackboard's user experience redesign for Learn Ultra has had a bumpy ride, with multi-year delays of getting any customers to use in production. They took more of a big bang approach to releasing Learn Ultra, and when customers pushed back saying that Ultra wasn't ready, this led to additional delays and eventually a change in the design team. D2L's Daylight has proven to be a more iterative release of their new user experience. This year it is becoming difficult to separate LMS products from company finances. Instructure is trying to balance Canvas and Bridge growth to satisfy public markets along with a new executive team. Blackboard is dealing with corporate debt challenges while needing to fully release Learn Ultra. As mentioned in this post, D2L is moving strongly to the cloud with a new user experience while managing expenses. Schoology is trying to grow higher ed market under the radar. Moodle HQ took investment for the first time. There are a lot of open questions on the future of the academic LMS market, and we expect much to be revealed at the big summer (and fall) events. As for D2L Fusion, we plan to get a better read on how customers and prospects are reacting to the cloud deployment move and streamlined user experience. We are seeing real changes in the Brightspace design and deployment model, but do paying and prospective customers value these changes? Furthermore, will D2L be able to improve its customer service and delivery on promises made for new customers as well as it has improved its product design? As for Blackboard, Learn Ultra now has D2L's Brightspace as a major user experience to compete with as well as Canvas. There is a lot more changing in the LMS market than what is obvious on the surface. Update: Clarified D2L numbers to be specifically for AWS cloud deployment. Also changed several instances of "cloud hosting" to be "cloud deployment" to make terminology more accurate. It seems the boom years of innovation, and competitors fighting for the education dollar, is over. I predict in just a few more years there won’t be any further discussion on eLearning, and probably nothing innovative or new. Blackboard will shrink further and merge with D2L and Instructure will raise their prices pushing some to open source. ELearning is boring now, and highly adopted. A good thing I guess. James – that’s a bit cynical, but I do agree that there are some financial market changes that will continue to have impact on market and potential for innovation. I’ll avoid commenting on the speculations, but I would like to comment on the implied correlation between investment dollar and innovation. In the case of D2L as described in the post, the UX changes came during a period of relatively scarce dollars for front-end product investment, partially due to large diversion / investment in AWS cloud infrastructure. In prior years D2L was known as rolling out as many features as possible and thumping their chests about it. I suspect that part of the reason D2L focused more on improving design instead of features is that they could not afford to keep rolling out so many features, but this has led to the changes that customers need. The lack of dollars partially led to useful design innovation. Great piece, Phil. Your analyses are a great combination of techie under the hood details with market implications. Love. Thanks, Michael – appreciate it.